The Pengo scenario says that a penguin in the snowy wastes must stay alive by melting ice blocks, or shunting them along to squash the snow bugs which threaten him. The frame resembles one of those small hand-held word puzzles with letters printed on small squares which may be shuffled to rearrange them. The game requires a certain amount of strategic thinking in setting up kills. You can usually ‘electrify’ the walls (the edge of the screen) and daze any nasties that touch it, running them down if you are able. First in the market was Blaby’s Dodo and the Snow Bees by a long margin. This is a reasonable copy of the Pengo game and it contains quite reasonable graphics too. They are a little jerky due to the character position movement. As with most Blaby games, the sound quality and content is excellent (Blaby sound seems loud too!). As far as sound goes, it’s the best, but for playability it’s possibly the worst. Keyboard control is bad because is uses the cursors — Kempston, AGF and Protek joystick owners need not worry though. I found the game average and it has been outclassed on most fronts by others, not surprising perhaps, as it precedes them all by almost a year and Spectrum software has come a long way in that time. The snow bees in this game did resemble bees, which is more than can be said for most of the rest. Dodo is the oldest game out of the bunch, and it shows! Movement is by block and slow. The snow bees have a distinct advantage — they move faster than you do. Fences can be electrified four times during the entire game. The screen also seems very cramped. However, the ice blocks move smoothly. The colour is well used. One of the worst points is the keyboard layout, which is exceptionally poor. With this game, the title screen provides you with two pictures, one for the game itself and another, which is an advert for Tutankhamun — a bit like being in the cinema! On playing the game I found I had difficulty moving ice blocks with the keyboard. When I changed to my trusty Kempston I found I could by using the fire button. The game’s graphics are okay but a little flickery and the sound, whilst well used, is nothing special. This game is enjoyable but I preferred Freez’Bees to it. Pengy himself seems to resemble a fat Dracula! One thing to bear in mind in discussing the merits of Pengy is that it is in 16K — the only one. The loading time (with its advertisement screen feature) is very short — great. You are a very ghostly looking penguin, out to squash spongy looking intelligent creatures — well almost intelligent, actually they’re pretty thick, but every screen completed adds another snow bee to the game. Movement of snow bees penguin and ice blocks is smooth and fast. The keys are responsive and well positioned. Each time the fence is electrified the border changes colour, so you can see that the fence is definitely electrified. There are four differently coloured ice blocks which can be pushed together (they can’t be melted) for bonus points. An average Pengo but in 16K. I like Freez’Bees and it’s a good version. The movement of the penguin is especially good, and generally all the graphics were of reasonable quality. The odd, blob-like snow bees are particularly comical when they lie ‘dazed’ against the electrified wall. Their eyes spin round and round. The sound is good, but again Blaby’s is better. The control keys have a decent layout and Kempston owners are catered for. With all its elements and 10 skill levels, this game will never become too easy, but it remains very playable. Freez’Bees has the most options open to the player, ie you can alter the speed of the game from 0 to 9, there are good instructions, and a useful hold-and-quit key. When pushed, the ice blocks move very quickly to their destination — they also instantly crush the nasties. Freez snow bees are not over-intelligent, thank goodness, but once on your trail they won’t let up. The penguin himself waddles about most convincingly. The responsive keys are well placed and both sound and colour have been well used. What distinguishes Eskimo Eddie from the others is that it has two totally different sheets in the game. 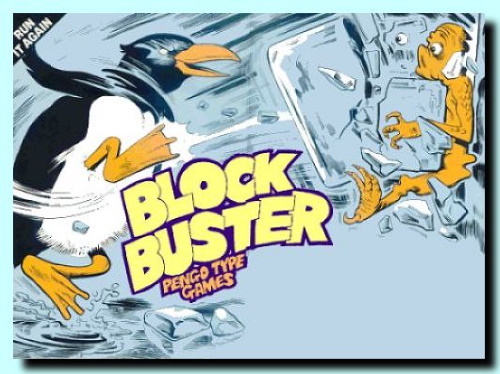 Ocean did this with Mr Wimpy, and while it gives you two games for the price of one it can be a bit irritating when you want to get on with the Pengo part. Still, a very small quibble and one which most people will probably disagree with. In the first sheet, Frogger style, you have to rescue Percy penguin from Growler the bear. There are two bears, slow and medium speed, and three jagged ice blocks which cross and recross the screen. You move from the bottom to the top, collect Percy, and then return. This has to be done three times before getting on to the Pengo sheet properly. From here on everything is like the normal Pengo, with electric fences, bugs and blocks. The graphics throughout are very good and smooth and the sound is about the best (after Blaby!) and I liked the small details like the chasing rainbow effect round the edge of the first sheet. Ail in all a very good game which gets tougher with each screen. One difference that no other Pengo has is that this version has two totally different screens, the first being to avoid moving ice holes and superbly animated polar bears, rescue a penguin from the other side and bring him safely back — three times. The second screen then resembles most other Pengo games. The ice blocks move very well, but if you do push a block, all the control keys are frozen (sorry, didn’t mean that!) until the block reaches the wall or a snow bug. This does pose problems — the bugs have a chance of catching you while you are stationary. Otherwise the graphics are very good, electric fences work well, ice blocks move smoothly and the sound is good. The snow bees get progressively more intelligent as each screen is cleared. A very good game. This was by far the best game in my opinion. It was a little different too, with the ladybird trying to kill garden creepie crawlies (and they trying to get her, of course). Instead of being white, the blocks are a decent garden green. Other changes were bells which, when rung by touching them, meant you could eat the nasties Pacman-style for a while. The graphics are super smooth, easily the best, the creepies have nice detail too. But it can’t beat Blaby’s Dodo on sound! Key control is good and there are lots of joystick options available. The best of the bunch for me. This is the only one without a bit of ice in sight. Instead you push/throw garden bricks at four different insects, and you are a ladybird. Apart from these differences it plays very like the other Pengos. Instead of electrified fences there are bells which can be rung and turn the insects to jelly. When you eat a jellied bug a bonus score appears, but the bell only rings for a short time. The action is fast, graphics very smooth (unlike most of the others), characters are large and detailed and very colourful. The keys are good and responsive, and I found this to be an addictive Pengo-type game. The two reviewer’s ratings have been averaged, but despite independent assessment of the games, they were very much in agreement. NB. Despite details printed on cassettes and advertisements, due to an error Software Projects Push Off is not 16K but 48K. The same is true of Thrusta.